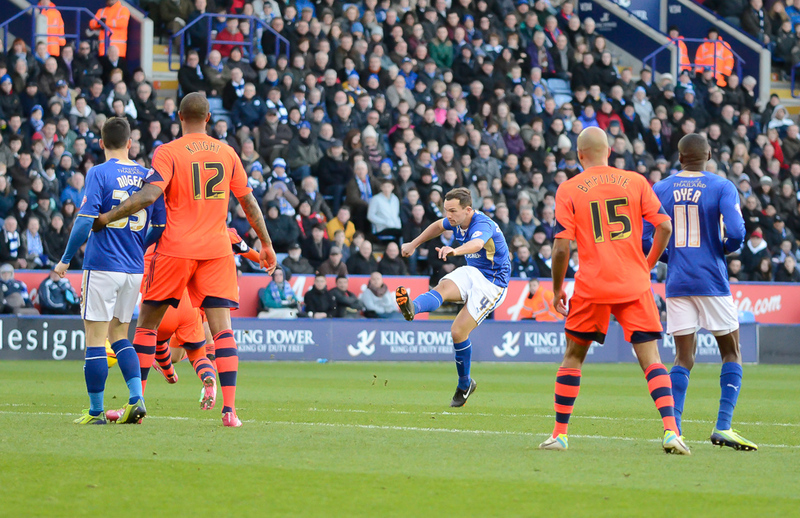 Leicester City ended 2013 in style with a thrilling win at Filbert Way to maintain top spot. Nigel Pearson named an unchanged side from the one that beat Reading on Boxing Day and there were two familiar faces in the Bolton line-up with Matt Mills and Jermaine Beckford starting for the Trotters. It was City who were quickest out of the traps and they took the lead on 5 minutes after a Dyer cross was cleared and then set up for Danny Drinkwater who struck a lovely low drive in off the post from 25 yards. Unfortunately this wasn’t the cue for City to push on and instead they relaxed and were punished when Bolton put together their first worthwhile attack in the 16th minute after Lee hit a low cross in to the City area and Moritz stuck out a foot and guided the ball beyond Schmeichel to silence the home fans. It was to get worse just five minutes later when Beckford collected a pass on the edge of the City area and was given far too much time and room to line up a low shot that wrong-footed Schmeichel. Beckford clearly enjoyed his moment and the predictable ‘cupped ear’ gesture followed in front of the East Stand. This setback seemed to spark City again as they forced Bolton back and an equaliser arrived in the 38th minute when Lloyd Dyer again found room on the left and picked out Knockaert with a lovely cross from the byline and the Frenchman planted a firm header past Lonergan to bring City level. But no sooner had City finished celebrating the equaliser than the visitors took the lead again and once again it was Moritz who delivered. There seemed little danger as he collected the ball on the edge of the area with plenty of blue shirts in front of him but he struck a low shot through a forest of legs and in to the bottom corner as Schmeichel was caught unsighted and flat-footed. This time it was City who made the instant reply in the 41st minute when another Lloyd Dyer cross was only half-cleared as far as Konchesky who struck a first time, angled drive that ricocheted off of Matt Mills and past a helpless Lonergan in the Bolton goal. 3-3! The second half started off at the same pace and there was action in both penalty areas and, just before the hour mark, a set to between Jamie Vardy and Zat Knight when it appeared that Knight had Vardy by the throat at one point. After it all calmed down the referee opted to book both players which incensed the home faithful. As City started to turn up the heat on Bolton they saw a superb 30 yard free-lick from Knockaert cannon back off the bar and Liam Moore somehow missed the gaping net with the rebound effort. In the 74th minute Lonergan clattered Vardy in the area but Nugent spurned the penalty opportunity and placed his kick too close to Lonergan. At the other end, former City loanee Mark Davies struck a deflected low drive that Schmeichel did well to turn away. Mercifully it was City that finally broke the deadlock in the 77th minute when the impressive Dyer left the Bolton defence standing with a run from inside his own half that ended with a low drive across Lonergan and inside the far post to raise the roof and give City a lead that they wouldn’t surrender this time. In fact the lead was extended in the last minute when one sub, Andy King, nodded down a clearance for another sub, Gary Taylor-Fletcher, to slam the ball home and seal the win in style. It was breathless fare for a good sized crowd that bodes well for the remainder of the season. It was a performance that was never dull and although the defence was not entirely switched on for the opening 45 minutes the control that that City brought to the second half was impressive and the desire to win was there for all to see. With the January transfer window opening soon Nigel Pearson will have the opportunity to fine-tune what looks like an already well-oiled machine. City, unchanged from the side that won at QPR, were quickly out of the traps with Dyer and Knockaert providing a threat on each flank. At this stage the power went off, but there was enough daylight to continue, and City went ahead in the gathering gloom in the 21st minute. Knockaert was brought down in the area by Cummings and Nugent planted home yet another spot-kick past McCarthy. With the lights going on and then off again City pressed forward and Morgan fed a ball to Nugent whose curling shot hit the outside of the right hand post. At one point the fans pitched in with their mobile phone lights creating an eerie scene. Nugent had another chance before Dyer was brought down as a promising move opened up for City. But it was a slender lead that City took in with them at half-time, at which point it was announced that the stadium was running on back-up power! Vardy had an early chance in the second half, but having raced clear and gone round the keeper the angle was too narrow and he hit the side-netting. Reading had their best spell then and Schmeichel did very well to palm a Drenthe free-kick over. 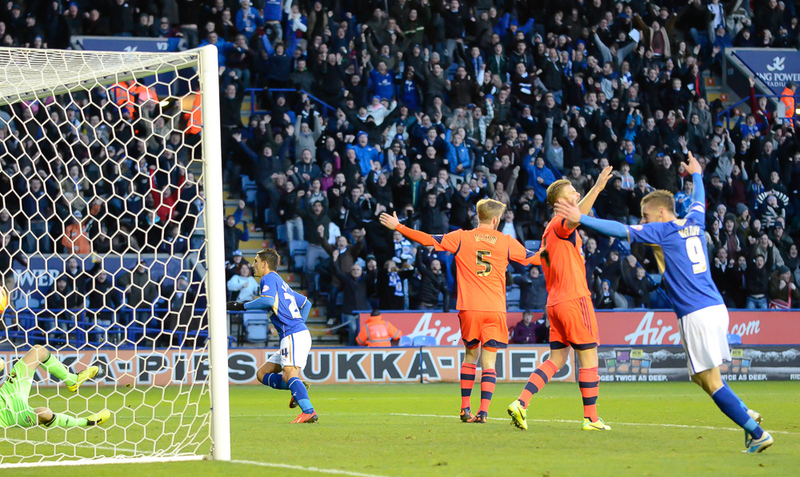 Drenthe then sent a shot just over, before Pogrebnyak found the net but was denied by the off-side flag. City managed to regain control, and an incredible run from Dyer ended with him sadly not being able to finish off what might have been Goal of the Century. Knockaert then left two defenders standing cutting in from the right before firing a shot across goal. Vardy then played a perfect ball to Dyer who had his shot blocked by Gorkss. However, Reading’s threat had fizzled out, the lights remained on, Burnley lost, and the final whistle heralded City returning to the top of the league. Leicester: Schmeichel, De Laet, Konchesky, Drinkwater, Morgan, James, Vardy, (Taylor Fletcher 88), Dyer (Hammond 86), Moore, Knockaert, Nugent (Waghorn 75). Subs Not Used: King, Miquel, Logan, Wasilewski. Reading: McCarthy, Gunter, Pearce, Pogrebnyak, Drenthe (Sharp 71), McAnuff (Le Fondre 83), Gorkss, Guthrie, Blackman, Williams, Cummings. Subs Not Used: Federici, Kelly McCleary, Akpan, Taylor. Referee: M Naylor. Attendance: We’ll get back to you. Nigel Pearson made three changes to his side for this top of the table clash at the end of a huge week for City, with Moore, James and Vardy returning to the starting XI. The first couple of chances fell to the home side, but Schmeichel dealt with a low shot from O’Neil and swerving effort from Kranjcar. There followed a lengthy interlude when a squirrel took to the field and the referee and club officials seemed to be at a bit of a loss as to how to get rid of it. Nugent eventually came up with the brainwave of chasing it off. We awaited the inevitable ‘Squirrel Goal’ from QPR’s corner after the game restarted, but Drinkwater headed Hill’s goalbound effort off the line. Rangers looked the most likely to go ahead as the action hotted up around Schmeichel’s goal. Kranjcar sent a shot whistling just wide, before the City keeper produced a good block to deny Austin, before Moore headed off the line and Schmeichel recovered to save from Phillips. But it was City who went ahead four minutes before the break with an excellent piece of direct play. Schmeichel’s huge kick upfield was nodded on by Nugent for Vardy to race past Dunne and fire off a perfect shot across Green and into the net. Rangers should have equalised just before the break, but Phillips spooned his effort over the bar with the goal at his mercy, and City took a precious lead down the tunnel. After an early chance for Dyer, which was snatched, QPR were in the ascendancy again, but their shooting was off-target and it was turning into a frustrating game for a side that hadn’t lost at home this season. City escaped penalty appeals for a Moore challenge on Phillips and Austin couldn’t find the target when well placed. Taylor-Fletcher replaced Vardy in the 68th minute and this heralded a good spell for City which saw Nugent troubling Green with a shot and James sending a dipping shot onto the bar. With five minutes to go the scales tipped further in City’s favour when Barton was dismissed, receiving one yellow card for man-handling Taylor-Fletcher to the floor and another swiftly followed when he threw the ball at his grounded opponent. Genius. City held out for three points to round off what must be regarded as a very successful week, considering the tough fixtures that City faced. QPR: Green; Simpson, Dunne, Hill, Assou-Ekotto, Carroll (Benayoun 69), Barton, O’Neil (Hoilett 46), Kranjcar, Phillips, Austin. Subs Not Used: Murphy, Traore, Onuoha, Jenas, Henry. Leicester: Schmeichel, De Laet (Wasilewski 81), Morgan, Moore, Konchesky, Knockaert, Drinkwater, James, Dyer, Vardy (Taylor-Fletcher 68), Nugent (Schlupp 78). Subs Not Used: Hammond, King, Miquel, Logan. Referee: P Tierney. Attendance: 17,713. 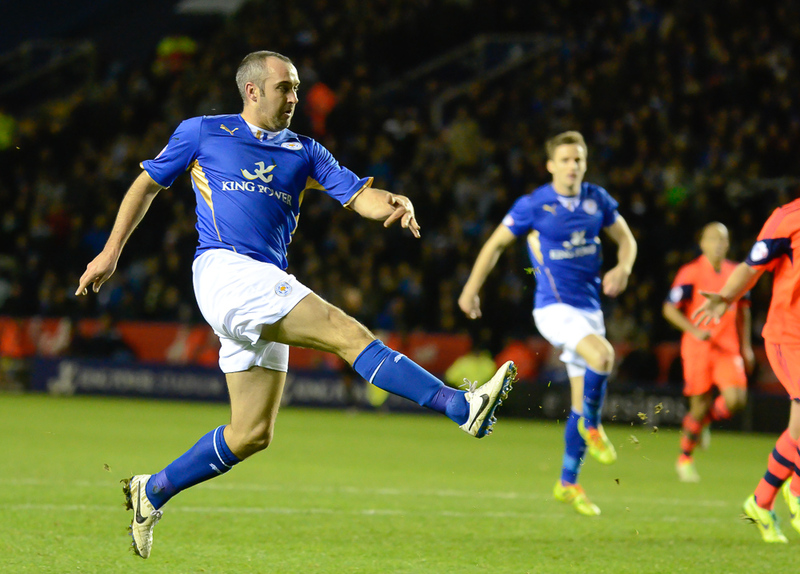 Leicester bowed out of the League Cup at the quarter-final stage on Tuesday night at the KPS. Although they gained some credit from a 3-1 reverse against Manchester City the enormity of their task was perhaps summed up with twenty minutes to go when Silva was replaced… by Nasri. Nigel Pearson made four changes with Wasilewski and Miquel in defence; King in midfield; and Taylor-Fletcher partnering Nugent up front. Manuel Pellegrini, after his first bit of silverware for Man City, elected to send out a strong side, and was rewarded with an early goal. After a lively start, Man City were awarded a free-kick for a foul on Dzeko. Kolarov, seemingly effortlessly, swept it into the top left hand corner from 30 yards. City were trying to press forward, when they were allowed a touch of the ball, but their best chance of a break was halted when Dyer was up-ended by Navas, who picked up a yellow card. City’s free-kick only ended up with their Premier League opponents hitting them on the break, but Schmeichel denied Dzeko with a fine block. Schmeichel also had to be alert to parry a fierce Kolorov shot over, but sadly City could not make it to half-time only a goal down. In the 41st minute Milner, sent in on the left, chipped a perfect ball onto the head of Dzeko, who couldn’t miss with his firm downward header from six yards. James and Vardy replaced Taylor-Fletcher and Knockaert for the second half. City created an early chance with a great move involving Vardy and Drinkwater, but King couldn’t produce a finish strong enough to trouble Hart. Three minutes later it was game over when Milner again teed up Dzeko, this time from the bye-line for a simple side-footed finish. The large away following could now rest easy, if they hadn’t before. Schlupp on for Nugent, was more than matched by Nasri on for Silva, but City gamely kept pressing forward. Morgan went close with a header before City finally found the net with thirteen minutes to go. Konchesky found Dyer in the box with a precise pass from the left, and the City winger lashed it past Hart at the near post. City couldn’t gain enough possession to worry the visitors any further but could take some comfort in having drawn the second half against a Champions League side. With promotion City’s absolute priority, all thoughts had already turned to Saturday’s lunchtime fixture at QPR. Leicester: Schmeichel, Wasilewski, Morgan, Miquel, Konchesky; Knockaert (Vardy 46), Drinkwater, King, Dyer, Taylor-Fletcher (James 46), Nugent (Schlupp 67). Subs Not Used: De Laet, Hammond, Moore, Logan. Man City: Hart, Zabaleta (Boyata 13), Kompany, Lescott, Kolarov, Garcia, Rodwell, Silva (Nasri 70), Navas. Milner, Dzeko. Subs Not Used: Pantilimon, Demichelis, Fernandinho, Negredo. Referee: R East. Attendance: 31,319. FOX 187 – The Leicester City Fanzine – in the shops now! FOX 187 features: an interview with Bryan Hamilton looking back on his time in charge of City; Something Old, Something New; Fully Programmed from 1993-94; Fox Diary; the latest from the Foxes Trust; Tales From the Riverbank; Tunnel Vision – days of the old enclosure; Foxed in the Head goes to Glasgae; the Chris Lymn Column; John Hutchinson looks at Matt Gillies’ departure in The Managers; Fox-Photos; Pride – of (3) lions; your letters, Facebook and Bentley’s Roof; Parting Shots – our favourite photos from the last month; and Frank outs Santa…. The Fox went down to deepest Suffolk to interview Bryan in his beautiful home a couple of weeks back. He has come a long way since his upbringing in the backstreets of Belfast. His international career was played out against a backdrop of The Troubles, when Northern Ireland went into exile and ‘home’ games were played at Hull, Coventry, Anfield and Goodison. International football returned to WindsorPark in 1975 when Yugoslavia were brave enough to visit and Bryan scored the only goal of a highly emotional occasion. Nigel Pearson made four changes to the side that were beaten at Brighton, with Moore, De Laet, James and Knockaert returning to the starting line-up. City got off to a flying start and the league-leaders’ goal was peppered with shots. Dyer, James and Drinkwater all had efforts blocked by defenders, with a couple of appeals for handball being ignored by the ref. Then Knockaert fired in a shot that was too hot for Heaton to handle, but he recovered it ahead of any blue shirts. City got the reward their lively start deserved when former-City defender Mee brought Vardy down in the area. Nugent sent Heaton the wrong way with his spot-kick to put City back on top of the Championship. Burnley came close to an equaliser soon afterwards when a glancing header from Ings kissed the left hand post; but City continued to create chances and Nugent’s header from a Dyer cross forced Heaton into a good save. 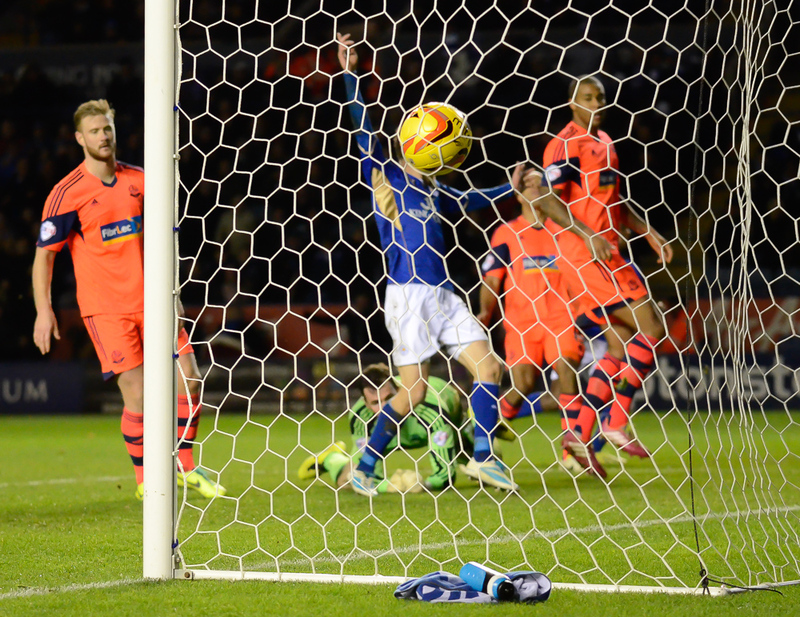 Vardy then flashed a shot across goal that went inches wide. Both sides retreated into their shells a little towards the break with little action at either end and City took the lead in with them at the break. Sadly, this state of affairs didn’t last long after the restart when Ings got on the end of a Trippier ball that passed through City’s defence to put the Clarets back on top of the league. Things almost got worse soon after that setback when a sloppy backpass from De Laet sent Vokes clear on goal, but he was denied by a fantastic Schmeichel save. City were struggling to create much and Pearson made a double change for the last twenty minutes with Taylor-Fletcher and Wasilewski coming on for Nugent and De Laet. Taylor-Fletcher went close with a clever flick and Vardy didn’t put enough on his header after Dyer did well to tee him up, but the chances dried up and there was no late pressure applied by City. Neither side had done enough to win the game, but it was disappointing to start a very challenging week with a point after surrendering the lead. Leicester: Schmeichel, De Laet (Wasilewski 70), Morgan, Moore, Konchesky, Knockaert, James, Drinkwater, Dyer, Nugent (Taylor-Fletcher 70), Vardy (Schlupp 83). Subs Not Used: Hammond, King, Miquel, Logan. Burnley: Heaton, Trippier, Duff, Shackell, Mee, Marney, Vokes, Ings, Jones, Kightly (Treacy 72), Arfield. Subs Not Used: Lafferty, Stanislas, Cisak, Edgar, Stock, Long. Referee: Andy D’Urso. Attendance: 23,143.